The pre-Quaternary spans 99.95% of Earth History (see appendix). Nevertheless, knowledge of pre-Quaternary climates is significantly poorer than that of the last 2 million years. Going further back in time, more and more evidence for past climate change will have been removed by subsequent climatic episodes. The Precambrian comprises 85% of Earth history, yet very little can be said about palaeoclimates from these ancient times, and what is known is not known with any degree of confidence. In passing, it may be noted that there is evidence for two major periods of glaciation, one at 2.7 to 2.3 billion years (Ga) (Frakes, 1979), the other more recently at 0.9 to 0.6Ga (Frakes, 1979; Williams, 1975b). The former of these occurred at a time when the current tectonic regime of continental drift was in early growth. 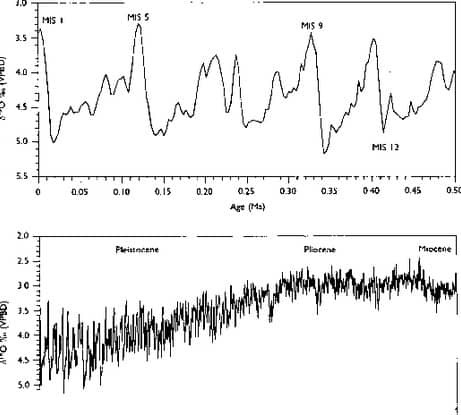 There appears to be no evidence for glaciation at other times during the Precambrian, a feature that has puzzled palaeoclimatologists, since it is generally assumed that the Sun was considerably fainter at that time. For the interested reader, Frakes (1979) and Crowley & North (1991) offer reliable accounts of Precambrian climates.